They have camels wandering around there? These collages are such fun to get many pictures all together. The camels look like they are trees or bushes shaped to resemble these animals...are they? there's those CHIS camels again!!! A Cliff Walk? 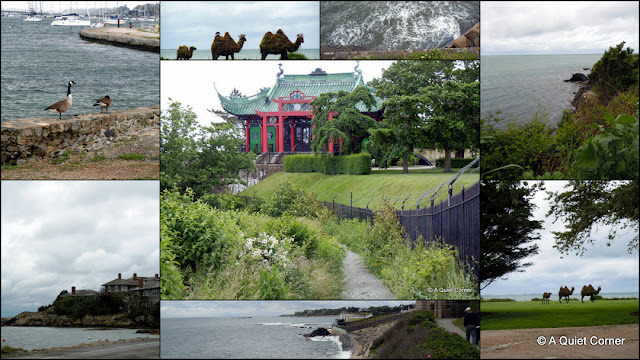 Looks like a very beautiful walk... but camels in RI? hmmm! LoL! What an amazing Mosaic! You should frame it. I especially love the red in the middle. Funny seeing camels in Rhode Islands, even camel statues. Lovely photos and mosaic. That is a place I would love to see. Thanks for sharing.